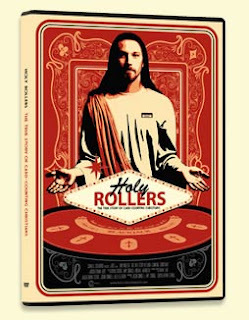 Holy Rollers calls itself "The True Story of Card Counting Christians" and documents a team of card counters that called itself "The Church Team." The team was run by two guys, Ben and Colin, who shared a love of blackjack and Jesus. At some point they decided to expand their little blackjack team by recruiting and training new players. Who better than members of their church? The team grows with both players, and investors, and from 2006 to 2009 they manage to win $3.2 million dollars before disbanding. The film uses some simple animation to explain how card counting works at its most basic level, and also to explain how their bankroll is set up. The Church Team had investors, players, and managers. Their target was to win $100,000 at which time they would "close the bank" and divide the money. The money was then divided among investors, managers, and players, but they never tell you what the percentages are. The players are paid based on the number of hours they played. In the case of the teams I played on the total number of hours played would be divided into the amount of players share dollars to determine the hourly rate. When a bankroll was closed they would have a team dinner and checks would be handed out. In the scenes shown the player hourly rate ranged from about $50 and hour to $150 per hour. The reason this can vary so much is that if the team gets lucky and hits their $100k target quickly then there are less total hours to divide by. This team was winning like crazy for 5 months, up $800k, and then hit a 10 month losing streak. At some point Ben and Colin decide they need to retest everyone to see if they are playing well. Unfortunately 5 players fail the test. One player named Jason repeatedly failed his tests, and decides that blackjack is not for him. They mention that he had played 182 hours in 6 months, and in the last month was minus $48k. But again details are lacking. This is not enough information for people who understand card counting, and the wrong type of information for people who don't. Because the bankroll has been going on so long the players have amassed a lot of hours. All teams must go through this at some point, and what happens is the players lose incentive to play. They realize that with all those hours already played they might be working for $5 per hour or less. Ben and Colin come up with a solution but very few details are given. They raise the players share in some way but we never know where that extra money is coming from. I can really relate to the road warrior scenes. Driving from casino to casino, counting stacks of money out on the bed that I know to be a Motel 6 from the bedspread. Win some, lose some, drive to the next casino down the road. I find it hilarious that Ben and Colin have won millions of dollars but we see them sharing a room with the camera man, and Ben and Colin drift off to sleep in the same bed. Certainly been there, done that, with guys sleeping on the floor as well. I think civilians will be cringing when they see the interviews with investors, some of whom are also players. You meet Colin's in-laws who initially think this whole blackjack thing is crazy, and not really in line with their Christian values, but then come around and say they maxed out a 2nd mortgage on their home to invest! Someone else cashes out their 401k, and another took out huge cash advances on their credit cards! It sounds like a recipe for a horrible end. But their experience was very much like mine. The investors in blackjack banks often do better than the players. The film states that the investors earned an annualized return of 35% on their money. Now back to theft. I once had a Japanese big player we hired tell me it was very good that I was hiring Japanese for this job because, "Japanese people don't steal." A few months later we were in Caesars Tahoe, gave him $20,000 and sent him over to Harrahs to meet a team mate on a game. He never showed up. When we eventually got ahold of him he claimed he was mugged between Caesars and Harrahs (about a 100 yard walk on a very busy street) and was so ashamed he went directly to the airport and flew home. Every team has to deal with stealing, but this is probably the most shocking story in the movie. Ben and Colin get a call from one of the team who tells them that a player we'll call Ben 2 is stealing. When they ask him how he knows this he says that 2 other team mates told him. How did those 2 other team mates know he was stealing? Wait for it... "God told them." That's right. God came and spoke to these people and told them that Ben 2 was stealing, and this was good enough for them. Coincidentally Ben 2 is the only non-Christian on the team. I would like to point out that people have been burned as witches based on similar evidence, but again there is a maddening lack of details. Was Ben 2 a losing player? What did the statistics say? Was he kicked off the team or did he quit? Unfortunately Ben 2 would not comment in the film. I think blackjack players will enjoy this film, but not sure if it will hold a civilian audience. The problem is their is no narrative thread. There is not a real story, it is more like scenes from the life of a blackjack team, and I am not sure that non-players will stay interested for 90 minutes. Ben and Colin have moved on from the team. Now they are offering training to people who want to learn to count cards. You can read more about them at their website http://www.blackjackapprenticeship.com/. The film has been making the rounds on the festival circuit, and as far as I know they are still looking for a distribution deal. You can buy the DVD at http://holyrollersthemovie.com/merchandise.html. Finally, here is the trailer for the film. 1. Yeah, Warner Brothers bought distribution rights. 2. Most of us are still friends with "Ben 2". He's seen the doc and liked it, has no ill will towards the decision to not work with him on the team, though he isn't interested in being interviewed. He had played for our previous team for a season, so we had known him for years. He continued to play for the team for quite a while after the "allegations", but we did eventually part ways on good terms. 3. There was never any evidence that he ever stole from the team, nor do I believe he ever did. Though over the years, there were a few people who admitted to having taken or dropped some money.